CHICAGO – Hannover Fairs USA, the organizer of DOMOTEX USA, today announced that top-tier European floor covering innovators will highlight their latest products at the inaugural show in Atlanta from Feb. 28 to March 2. Many of the European companies exhibiting in North America exhibited at DOMOTEX Hannover in January, showcasing the industry’s commitment to advancing premium floor coverings and technologies across the globe. “Approximately 45 percent of the inaugural show’s exhibition space is dedicated to international exhibitors,” said Raymond Bianchi, vice president of events & business development at Hannover Fairs USA. (HFUSA). “As with our North American-based exhibitors, the European exhibitors embody the next generation of flooring – from high-end hardwood and laminate to carpets and wood flooring production and processing technologies,” he added. Giorio, an Italian-based company that specializes in parquet flooring, will showcase its Alma flooring lines. On display will be the DESIGN collection – Palladio model of handmade ‘cubic’ geometric parquet flooring for high-end renovations. Palladio is available in a variety of colors and is made of European Oak. Giorio will also display its DOGHE collection of parquet flooring that features embossed knots repaired with declining filler, which results in a brushed, irregular surface. Also, on display will be the SPINE collection of different parquet designs suitable for many architectural styles and made of European Oak to blend with both traditional and modern furniture. Finally, the company will display the INTARSI collection of unique geometric parquet flooring that combines wood and metal, such as steel and brass. All collections are exhibiting in Hall A3 at Booth 1520. Ribadao, a Portuguese-based and family-owned company, will showcase its engineered flooring, European Oak and Exotics hardwood flooring, including wide-width and long-length boards. At DOMOTEX USA 2019, the company will show its Rio collection of high-end engineered wide-width and long-length flooring, including Rio’s latest line of Tua flooring that features a subdued blend of tan and gray coloring for a more contemporary look. Ribadao will display some of its natural exotic hardwood flooring from South America and Africa. The company also will launch its Caravel line of engineered flooring. Ribadao is exhibiting in Hall A3 at Booth 1641. “The Ribadao family has been involved with DOMOTEX Hannover for years and believes the best way for the company to expand its U.S. presence is to exhibit at the inaugural show in Atlanta,” said Bruce Hammer, vice president of sales in North America for Ribadao. “We look forward to partnering with DOMOTEX USA and to taking advantage of all the new show has to offer, especially the opportunity to meet face-to-face with our customer base. We expect to connect with distributors, branded resellers and other OEMs who want to increase their capabilities with product lines or expanded capabilities on existing lines,” he added. Faus International Flooring of El Real de Gandía, Spain will launch during the show its 3XL laminate flooring, new ultra matt technology and floor coverings made specifically for high humidity areas, such as kitchens and bathrooms. The company is exhibiting in Hall A3 at Booth 1447. “For the last four years, we have exhibited at DOMOTEX in Hannover and DOMOTEX asia/CHINAFLOOR,” said María Saurí, CEO of Faus International. “We believe DOMOTEX USA is the perfect event for Faus International to launch our products into the U.S. marketplace. We look forward to showcasing our laminate flooring designs, such as our Masterpieces line of classic designs inspired by the European palaces of the 18th and 19th centuries, to all DOMOTEX USA attendees,” she added. PointeX Spa is an Italian manufacturing company that produces a wide range of products for events and set-ups in general, as well as for the wedding and Christmas sectors. 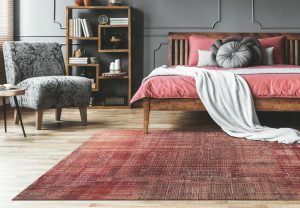 In addition to these, Pointex has developed the Susy home collection, including runners, mats and rugs designed to protect high-traffic floors such as hallways, kitchens and living rooms. The collection features a non-slip function, different lengths and a variety of designs. All Pointex products are produced in-house at the company’s Florence location and are fully customizable to meet the needs of each client. The company is exhibiting in Hall A3 at Booth 1345. 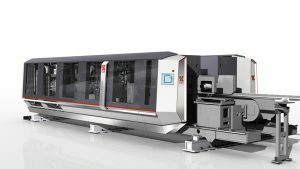 Kraft Machines, the recently founded and Georgia-based subsidiary of Kraft Maschinenbau, a German-based designer and manufacturer of tailor-made production systems from entry-level machines to “high-end” solutions, will be showcasing its technologies for the flooring production process. From processing equipment like sawing technologies and Double End Tenoners to handling and packaging solutions, Kraft offers turn-key flooring production lines. During the show, experienced Kraft staff from the United States as well as from the headquarters in Germany will be in the booth to demonstrate and discuss Kraft Machines wide-ranging product portfolio and service capabilities for the North American flooring production marketplace. The company is exhibiting in Hall A2 at Booth 655. “Kraft Machines services engineered flooring manufacturers including wood, laminate, Luxury Vinyl Tile and others across the U.S. Many of our clients will be attending or exhibiting at DOMOTEX USA 2019, which offers us a perfect venue to showcase our German-made machines and the newly founded U.S. subsidiary,” said Mike McAdams, executive vice president at Kraft Machines, Inc. Kraft Maschinenbau is a longtime exhibitor at Ligna, the Deutsche Messe trade fair for woodworking and wood processing in Hannover. Ciranova, a Belgium-based brand of Debal Coatings, will launch at DOMOTEX USA 2019 its Hardwaxoil TITAN fast drying oil for finishing wood floors. 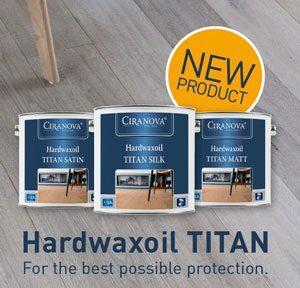 Hardwaxoil TITAN’s unique protection and composition provides an exceptional natural-look and scratch-resistant finish. The oil can be applied mechanically and is also easy to apply with a roller. Additionally, Hardwaxoil TITAN can be used as a protective layer on top of the company’s other products, including its Hardwaxoil, Hardwaxoil Magic and UN1CO color oils. The product is available in 3 gloss levels – Matt, Satin & Silk. The company is exhibiting in Hall A3 at Booth 1309. 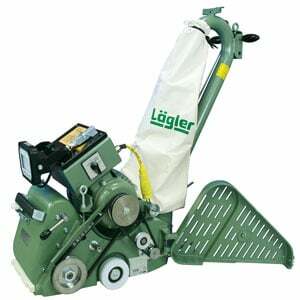 Lägler, a German-based manufacturer of sanding equipment for hardwood flooring and subfloor treatment, will be celebrating the 50th anniversary of its iconic HUMMEL® belt sanding machine at the show. The HUMMEL® is the best-known floor sanding machine in the world, combining an aggressive sanding, three-stage drum pressure regulation and belt tensioning device with an integrated automatically-regulated belt guidance. To mark the 50-year milestone, all HUMMEL® machines that leave the factory in 2019 will be equipped with an ultra-bright LED light, which Lägler will have on display at DOMOTEX USA. In addition to the HUMMEL®, Lägler will also be demoing its TRIO®, SINGLE®, and FLIP® machines. The TRIO®, a powerful three-disc sander, can be utilized for subfloor treatment, prefinished parquet floors, and fine and intermediate sanding. The SINGLE® is a single-disc sander used for difficult subfloor preparation and renovation work. Finally, the FLIP®, designed for difficult edge and corner sanding, will be shown with its new milling attachment which converts the machine into the most aggressive edger on the market. The company is exhibiting in Hall A3 Booth 1205. Floor covering companies of all sizes from across Europe, North America and Asia will launch new products during DOMOTEX USA 2019. To register to attend the show, go to https://domotexusa.com/attend/. DOMOTEX Mexico is the next step in Deutsche Messe’s globalization of the DOMOTEX brand. As a result of an agreement between Deutsche Messe and UBM, the event will premiere from October 15-19, 2019 at Expo CIHAC, Latin America’s leading trade show for the construction industry, held at the Centro Citibanamex in Mexico City.